If you’re an entrepreneur looking to fund your first startup, we have good news and bad news. The good news: You have many options and many paths to success. The bad news: You have too many options and will hit many forks in the road. This double-edged reality is easier to grasp if you see a model for it. In this article, we’ll take you on a startup’s funding journey, from bootstrapping to venture capital. Note that this is an idealised picture of a startup’s funding journey. Reality is much messier, with some startups securing venture capital as their first form of outside funding and others never relying on anything more than bootstrapping and a small loan. While some options are more appropriate for some stages of business’s life cycle than others, almost anything can happen on this journey. 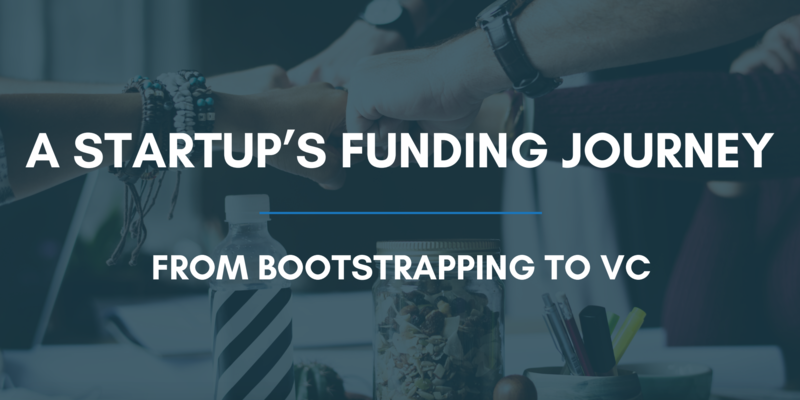 To ‘bootstrap’ means to use your own funds, or those of family and friends, to get your business off the ground. This is where most startups begin. The simple answer: no. In fact, bootstrapping for as long as you can is a highly strategic move. Why? You retain full ownership of your company for longer, staying true to your vision for the company without outside stakeholder interference. You show funders that you believe in your business enough to invest your own hard-earned money in it. You prove to funders that you know how to manage money. If you can do it with your money, you can probably do it with other people’s. You give yourself a concrete stake in the success in the business. You’ll be more motivated to make it happen, and funders will recognise this. Stretch your own money as far as possible. Use a coworking space instead of renting an office. Find early adopters and let them help you spread the word about your business for free. Pitch your idea to your friends. You’ve successfully bootstrapped your business into the world. But now you find your funds growing thin, and you need a bit of capital to get from one step to the next. A likely option at this stage is a loan. Bank loans are the most well-known type of business funding. Particularly outside of London, it is not difficult to find business owners who know of no other options. However, the truth is that traditional bank loans are only one type of debt funding. (Then you have even more options for equity funding, which we’ll discuss below.) If your application for a loan from your favourite bank is rejected - and many are - you still have options. Alternative Business Funding is a fantastic resource for pinpointing alternative loan sources, such as peer-to-peer lending platforms and banks tailored to the needs of entrepreneurs. StartupDirect is one such alternative option. If your business involves research and development or will have a positive environmental or social impact, don’t jump straight to loans. There might be a grant out there for you. Grants are different from every other type of funding discussed here in that they are essentially free money. The government and other large organisations award grants in order to help create businesses that will stimulate economic growth or fulfil some other overarching goal. The UK government’s innovation agency, Innovate UK, is a major provider of grants for cutting-edge tech companies. Grant funding is perfect for startups that are still perfecting their technology and are not ready for the pressure to generate quick returns. Especially if you’re new to entrepreneurship, you’ll want more than funding. You’ll want mentorship and connections to those whose skills can fill your gaps and whose capital might be useful for your future funding rounds. You’ll want to know how to turn your awesome product or service into a money-making business. Accelerators are essentially schools for high-growth businesses. They may specialise in a particular sector, such as marketing, advertising and commerce accelerator Collider. Some are attached to large corporations, such as Microsoft Accelerator. Once you have some traction, you may be ready for equity funding, and your first type of equity funding is might be raised from crowdfunding, a large group of investors with a very small stake in your business. In crowdfunding, rounds are raised through internet campaigns accessible to anyone who registers on the platform. This type of funding is ideal for B2C (business to customer) companies. Both angels and the crowd can be a tireless source of funding, especially if you’re looking for under £1 million per round. Crowd for Angels is one example of a UK crowdfunding platform. Visit their website to get an idea of what these sites are all about. If the crowd is a lot of people who invest a little money, business angels are a smaller, more closely involved team who invest a lot of money. Angels are high-net-worth individuals who often actively help grow the businesses they invest in. Note that while they’re individuals, it’s common for one startup to have several (or many) at the same time, with one or two lead investors who help the entrepreneur make important decisions about the business. Using an angel’s capital, connections, and experience and knowledge of entrepreneurship and your sector is one of the surest ways to take your business to the next level. Typically offering the more money per round than any other form of funding, venture capital can be notoriously difficult to secure even for successful startups. But if your business is still a startup, even pre-revenue, don’t count yourself out. There are VC firms that prefer to invest in promising startups very early in their lives. These pre-seed and seed rounds can be as low as £5,000, though the figure is usually closer to £50,000 - £500,000. The important point to note is that VCs are often flexible. If your business model, team, traction are strong enough, many firms will consider investing now regardless of your stage and evaluate businesses on a case-by-case basis. Some VCs, such as Funding London and Forward Partners, even specialise in funding early-stage companies. The funding journeys of modern startups are endlessly varied. The best way to chart your own course is to be familiar with all the different paths you can take along the way. To learn more about startup funding options and meet some of the organisations mentioned in this article, join us for our 1st May (17:30 - 20:30) event, ‘Secure Funding for Your Startup’ at WeWork Chancery Lane. Secure your ticket here!